A rally In Canada was held in support of not only Ilmi Umerov, but all the Crimean Tatar political prisoners as well, the Crimean Tatar activist in Canada Elvira Saale wrote on her Facebook page. “Thanks to everyone who came to the rally today! This meeting is very important for the Crimean Tatars in the occupied Crimea and personally for Ilmi Umerov and his family!” She said. Saale further noted that this rally is also a message to the FSB that the association of the Crimean Tatars will not remain silent against arbitrariness and abuse against the Crimean Tatar people. 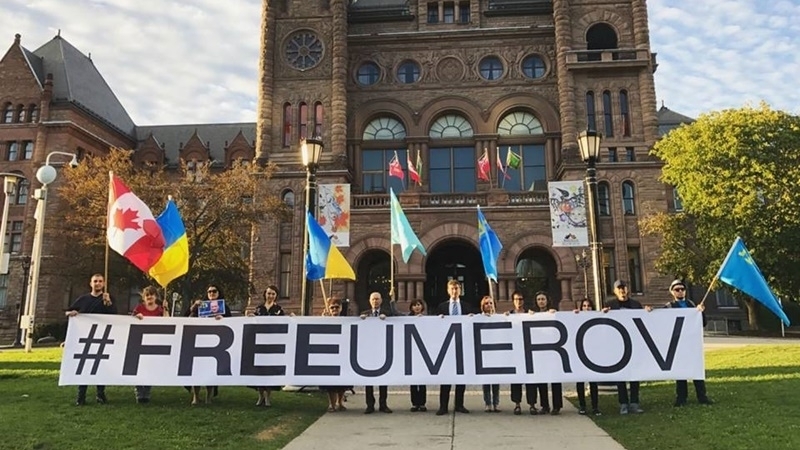 Earlier, the association of the Crimean Tatars of Canada urged all those not indifferent to come near the Legislative Assembly of Ontario (Canada) for a rally in support of Ilmi Umerov, the Deputy Chairof the Mejlis of the Crimean Tatar people and other political prisoners who had been convicted by the Kremlin. Reference: September 27, the Kremlin-controlled Simferopol district court passed a verdict in the case of Ilmi Umerov and chose a preventive measure in the form of two years in colony-settlement. October 2, it became known that the text of the verdict and accusations against Umerov contained inconsistencies.